GodswordsAre powerful two-handed swords that were released on 28 August 2007, along with the God Wars Dungeon. Requiring 75 Attack to wield, they are among the strongest non-degradable melee weapons to be found outside Daemonheim. A godsword consists of a godsword blade, to which a godsword hilt is attached. One hilt exists for each of the four RuneScape gods whose armies still fight in the God Wars Dungeon, with the exception of Zaros: Armadyl, Bandos, Saradomin, and Zamorak. Consequently, there are four different godswords: the Armadyl godsword, the Bandos godsword, the Saradomin godsword, and the Zamorak godsword. Each godsword has a different appearance, and a unique special attack or passive effect, but they all have the same combat bonuses. A godsword is created by smithing the three different godsword shards into a godsword blade at an anvil. Doing so requires 80 Smithing, though the Assist System can be used, and gives a total of 200 Smithing experience. A godsword hilt is then attached to the godsword blade, which requires no levels and can be done by any player. Hilts can be attached or removed at any time. Godsword hilts are dropped exclusively by the generals within the God Wars Dungeon (aside from Nex) and godsword shards are dropped by the generals and their bodyguards. Somewhere near the end of the Third Age, Zamorak had been pushed back and contained in the Forinthry region. His defeat seemed inevitable. A loose alliance between Saradomin, Armadyl and Bandos began construction on the godsword, a weapon meant to ensure Zamorak's final defeat. The blade itself was forged by the aviantese, while each of the of the three gods created hilts that would control the blade's tremendous power. 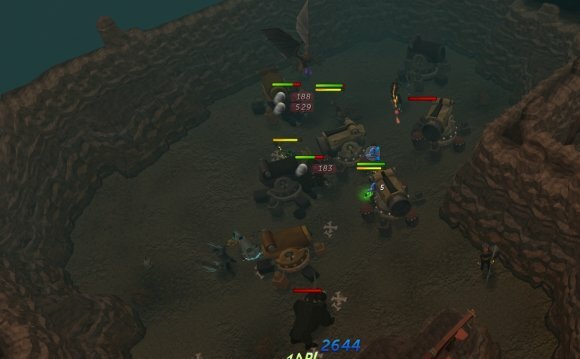 A squadron of Armadyl's best aviantese was given the task of delivering the godsword to the army of Saradomin, who was engaged in battle with Zamorak's forces. However, the existence of the blade had been leaked to Zamorak and aware its destination, he sent a battalion of his best forces led by one of his most powerful generals, the mighty K'ril Tsutsaroth, to capture the blade. They laid an ambush for the aviantese transporting the godsword. Zamorak created his own hilt in hopes of using the weapon to break the siege of his forces by the other gods. The Bandos godsword can drain the opponent's Defence by 1 level, until its Defence falls to 90% of the base. It is most potent against boss encounters which allow time for successive drains. The Saradomin godsword can heal the wielder by 3% of their maximum life points and recover 3% of their maximum prayer points. It can eliminate the need for food on Slayer tasks, and act as a supplement to healing against bosses. It is also useful to those attempting the TzHaar Fight Cave. Prior to the Evolution of Combat, all four godswords had different special attacks. To compensate for the loss of their special attacks, each godsword was given a passive ability that is meant to mimic its old special attack. Although Nex is a leader within the God Wars Dungeon, she does not drop a hilt; as such, there is no such thing as a Zaros Godsword. Before her release in January 2011, many players speculated that she would drop a Zaros hilt. However this never happened as technically, Zaros was never part of the God Wars and therefore wouldn't know about the Godsword, so there was no point in making a hilt.